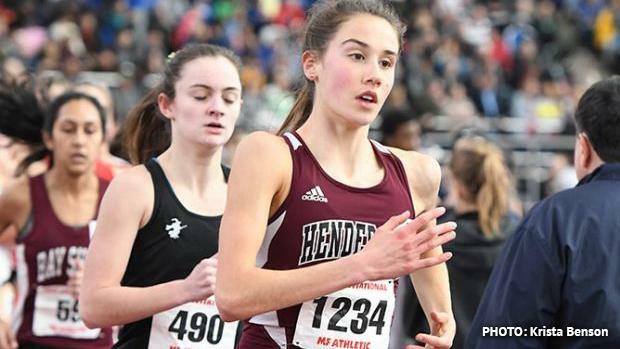 Like the mile, the scratch of 3K state record holder Marlee Starliper has shaken up the field in the 3,000 meters. Suddenly the field is much more wide open with a number of girls that should contend for the state's top spot over 15 laps. The new top seed is Jenna Mulhern of West Chester Henderson. The ninth grader made her indoor career debut a successful one, running 9:55 at Yale earlier in the season. Mulhern was a runaway XC state champion in the fall, and she'll have a very chance to win her first indoor state crown. The freshman will be challenged, though. Gionna Quarzo of Brownsville Area has had an exceptional winter. She's posted some impressive results and could be primed for a run at the title. Oakland Catholic's Hannah Schupansky ran 10:01 to win at a TSTCA. She's been in contention for state titles before, and on Sunday she'll look to get gold. Bethel Park's Emily Carter won the TSTCA Championship 3K last week and has some great experience doubling (she's in the mile earlier), which will bode well for her. Others doubling back from the mile that could contend are Friends' Central's Lydia Russell, Academy of Notre Dame's Jessica Schneider, Sharon's Gianna Labbiento, and Germantown Academy's Isabelle Goldstein. There are some good kickers in this bunch that could make some late moves if they hang in the race. All 12 entries have a shot at getting inside medal territory in this race. Up front, we could see the lead exchange hands as the race will turn into a duel in the final half mile.